The vastly increased level of competitive intensity faced by corporations and the increased costs of selling have radically changed the nature of the traditional selling process. Key or “strategic” accounts have now become a company’s most important asset, in some cases supplying in excess of 80 percent of a firm’s revenues. 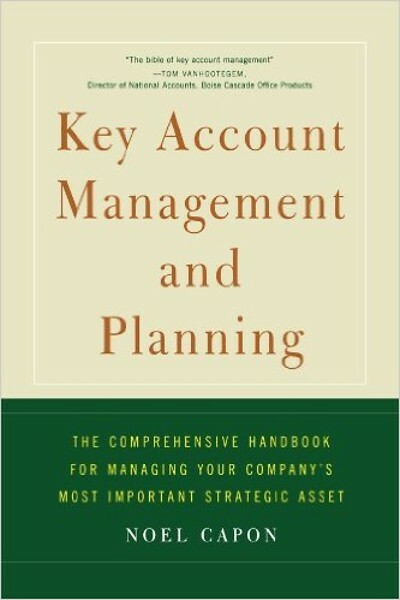 Here, in one powerful volume, key account management expert Noel Capon provides the most comprehensive treatment of key account management and planning yet published. For the first time, Capon introduces his breakthrough four-part “congruence model” of key account management — a new, thoroughly researched approach to optimally managing your key account portfolio. First, the author shows how to select and conceptualize the key account portfolio; second, how to organize and manage key accounts; third, how to recruit, select, train, retain, and reward key account managers; and fourth, how to formulate and execute strategy and issues of coordination and control. This congruence model serves as a backdrop as Capon takes the reader step-by-step through the vital functions of key account management including identifying key account criteria, considering the threats and opportunities for the key account, and understanding the roles and responsibilities of critical players. Capon backs up his points with extensive research, real-life stories of successes and failures at a variety of companies, and clarifying figures. Special chapters are devoted to partnering with key accounts and in-depth information on global key account management, an increasingly important weapon for staying ahead of the competition. Timely, important, and essential, Key Account Management and Planning is the only reference handbook those with key account responsibilities will ever need.